Former Eurovision winner Alexander Rybak usually has a rather busy time of it in the run up to Eurovision each year, and this year is no exception. Not only has young Mr Rybak been busy featuring in a popular TV series in Norway, he’s apparently heading East for Easter. Alexander will be back there tomorrow night for the first of two appearances. He will be holding a concert at the Ice Arena in Orsha at 18:30 CET, with specially invited guests, including singers Sasha Nemo, Larisa Gribaleva, and Miss Bride. Compere for the evening will be Artem Akhpash. Minsk will be the next port of call on his whistle stop visit to Belarus, when broadcaster BTRC will be rolling out the red carpet. 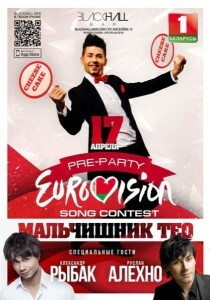 A Eurovision preparty has been organised to wish this year’s Belarusian entrant TEO the best of luck before he leaves for Copenhagen. Cheesecake is not the only thing featuring on the menu on Thursday, as young Rybak will also be serving up his hits to all those present, where he will be joined by the 2008 Belarusian entrant Ruslan Alenko, who will undoubtedly give a rendition of his entry Hasta La Vista. The festivities are due to get underway at 21:00 in Minsk, with the famous BlackHall Bar the place to be on Thursday evening. Belarus, you can borrow him for a few days, but remember, Norway wants him back!